It was supposed to be a homecoming party for Miguel Cartagena. Carlos Maldonado didn’t get the message. 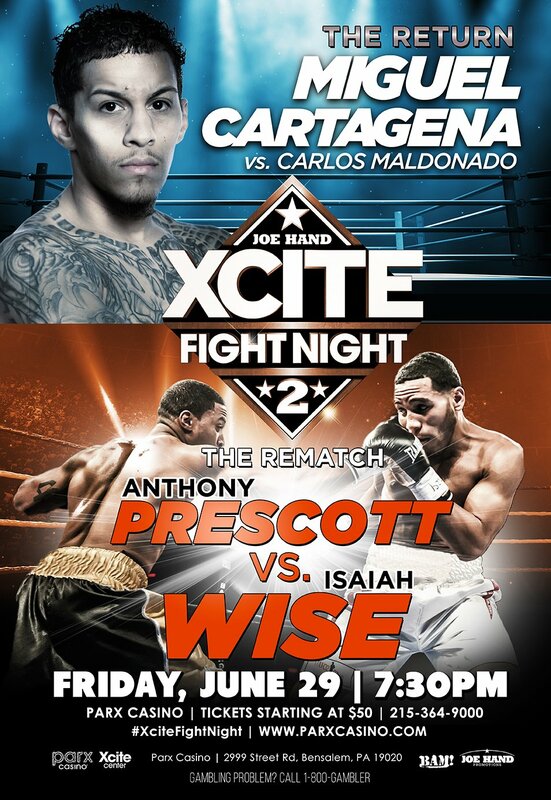 Maldonado spoiled Caratagena’s first fight in Philadelphia in four years, winning a split decision over Caratagena in the flyweight main event of Xcite Fight Night 2 at Parx Casino on Friday night. Maldonado (11-2, 7 K0s), fighting out of Los Angeles, dropped North Philadelphia’s Caratagena to the Xcite Center canvas with a sharp right hand early in the eighth and final round. He won on two judges’ cards, by scores of 76-75 and 77-74. The other judge saw it 76-75 for Cartagena. Cartagena (15-5-1, 6 K0s), 25-year-old former U.S. National and National Golden Gloves champion, was fighting locally for the first time since a victory in Chester in 2014. The much-anticipated semifinal lived up to its billing as local junior middleweights Isaiah Wise and Anthony Prescott brawled for six rounds in a rematch of Prescott’s split decision victory in March. But there may have to be a third chapter to settle for it good. The bout was scored a draw, with each fighter winning by 58-56 on one card and the other judge returning a score of 57-57. The two fighters, each wearing similar black and gold trunks, looked like mirror images. Prescott (8-8-3, 2 K0s) bloodied Wise, but could not score the early knockdown that proved decisive in their first meeting. Wise (6-2-1, 3 K0s), of North Philadelphia, had won six of his first seven fights before running into Prescott, a former football player at Cherry Hill East and Kutztown University. It took him longer than usual, but in the end the result was the same for rising welterweight Marcel Rivers. The North Philadelphian survived the first six-round bout of his career, earning a unanimous decision over Mike Crain (2-3-1). The scores were 58-56, 59-55, 59-55. The 31-year-old Rivers (6-0, 4 K0s), who is a PGW foreman by day, had won his previous three fights by knockout. Local favorite Victor Vasquez (21-11-1, 9 K0s) made a triumphant return to the ring. In his first action since 2016, he defeated the tricky southpaw Vinnie Denierio (3-5, 1 K0) of Elmira, N.Y. The veteran from North Philadelphia came on strong in the later stages of the six-round junior welterweight bout to pull out a majority draw, 57-57, 58-56, 58-56. In a fight that was all action from the opening bell, Christopher Burgos (1-2-1, 1 K0) outslugged the debuting Adolfo Serrano (0-1) in a battle of tough North Philadelphia lightweights. Burgos dazed Serrano early in the fourth and final round, and the referee called a stop at 1 minutes, 58 seconds into the period. Flyweights: Carlos Maldonado (11-2, 7 K0s) def. Miguel Cartagena (15-5-1, 6 K0s), SD 8, 76-75, 77-74, 75-76. Lightweights: Christopher Burgos (1-2-1, 1 K0) def. Adolfo Serrano (0-1), K0 4 (1:58).